These the are the “Obama Holdouts” that still control the executive branch of government a full year after Trump has come to office. Obama expanded the existing https://aim4truthblog.files.wordpress.com/2018/01/flag_of_the_united_states_senior_executive_service-svg.png?w=150&h=113 150w" sizes="(max-width: 239px) 100vw, 239px" />program of Deep State managers and appointed over 7,000 of the 8,156 bosses who are called the Senior Executive Service. Some call it the “Shadow Government”, and it is true that this federal cabal works in the shadows. https://aim4truthblog.files.wordpress.com/2018/01/ses-logo-2.png?w=100 100w" sizes="(max-width: 200px) 100vw, 200px" />From the way the State’s Senior Executive Service describes itself on its website and other publications and articles, you wouldn’t know that it is describing a shadow government, unless you looked carefully at what was actually being said and done. The SES consists of men and women, noncareer and career officials, charged with leading the continuing transformation of government. SES officials are neither excepted nor competitive service appointments. SES appointees typically support officials with the implementation of current administration policies. IN REALITY, THEY ARE TODAY ENTRENCHED BUREAUCRATIC PERSONNEL WHO DO THE BIDDING OF THE OBAMA-CLINTON REGIME AND THEIR GLOBALIST MASTERS. 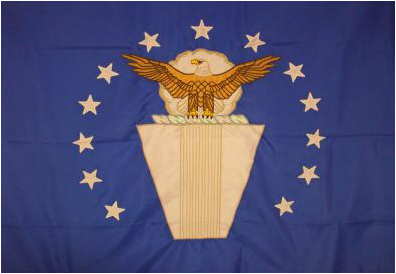 The SES was established by the Civil Service Reform Act of 1978 as an Executive Branch personnel system. 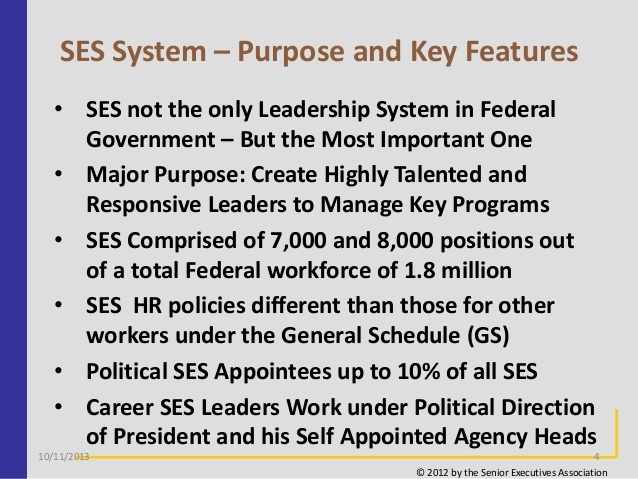 SES members serve in key positions, just below the top Presidential appointees, and are the major link between senior officials and the rest of the Federal workforce. The two types of SES positions are General, which can be filled by any type of appointment, and Career Reserved, which can be filled only by a career appointment. Noncareer Appointments are to a General SES position that, generally, is of a top policy determining character, who shares with Presidential appointees the advocacy of current administration policies. They can be made without regard to competitive requirements. Agencies may also set the pay level of the appointee. Career Appointments have no time limitation and provide certain job protections and benefits not conferred by non-career and limited appointments. Limited Term Appointments are nonrenewable appointments, for a term of three years or less. Limited Emergency Appointments are nonrenewable appointments, not to exceed 18 months, to a General SES position established to meet a bona fide, unanticipated, urgent need. The Senior Executive Service covers most managerial, supervisory, and policy positions in the Executive Branch above grade GS-15, except those that require Senate confirmation. The SES is a system in which salary and career status are personal rather than dependent on the position occupied. There are two main types of SES positions: career-reserved (which must be filled by career appointees) and general (which may be filled by career or non-career appointees, or by limited-term or limited emergency appointees). On page three of the report below, you can see for yourself that the 2016 Senior Executive Services Report lists that there were 8,156 SES members in 75 federal agencies. These “bosses” can’t really be fired because they are in charge. This is a good deal for SES members who are appointed as the all-knowing and all-powerful bosses of agencies they might not have even known existed before they were put in charge of them. And it was a brilliant play for Obama to have left this corruptcracy in place for Hillary’s final overthrow of America, but now which can thwart the attempts of the Trump administration to get anything done. Even though these SES key managerial positions are paid the best, you can hardly find a single SES member’s name on any list, anywhere. That’s why they call it the DEEP State. SES is a system of controlling power through secrecy, and acting with complete impunity – and getting a big salary to boot. The only people’s names you can find associated with these Deep State operatives is through the SES review boards that determine each year what “BONUS” these already over-paid SES bosses will receive. Yes, you heard it right – bonuses, like those Wall Street bankers and brokers who got bonuses after crashing the stock market. Look as you will, you can only find a list of names of the people who give these shadow government managers their bonuses. https://aim4truthblog.files.wordpress.com/2018/01/air-force-ses.jpg?w=430&h=430 430w, https://aim4truthblog.files.wordpress.com/2018/01/air-force-ses.jpg... 150w, https://aim4truthblog.files.wordpress.com/2018/01/air-force-ses.jpg... 300w" sizes="(max-width: 215px) 100vw, 215px" />We provide at the link below, the government’s own website that lists the members of one particular Review Board. This SES Review Board is for the Department of Justice. Oops, if you read the prior attachments, you might have noticed that the government clearly states it is “forbidden” to have a SES system in the Department of Justice. Obviously, by the evidence below, you can see that there are SES members in the Department of Justice. Don’t worry, just another Deep State lie to cover up the names of the SES shadow government. But we do have a list of the people who give raises to the SES members in the Department of Justic. Raises for these SES members who don’t exist but are the bosses. It might seem easy to criticize the Deep State from an armchair geo-political perch, but even Main Stream Media and government agencies have noticed the SES and found fault with its performance and Obama’s huge push to make it work at any cost. In an article entitled, Can the Government Fix Its Corps of Managers? The Senior Executive Service isn’t operating as it was designed to do, from The Atlantic in January of 2016, an objective assessment finds the SES program to be lacking in many ways. This emblem is worn by employees of SES so that they can identify one another by their team “flag”. Now you know who they are, too. Going forward we can spot the members of Obama’s Army. workers, called the Senior Executive Service, to be the executive branch’s expert managers, linking appointees to the rank-and-file. But today, a new report finds, the corps isn’t operating the way it’s supposed to be. And officials—from the Obama administration, to members of Congress, to the managers themselves—agree that they still haven’t perfected the art of running the federal government. When the SES was created in 1978, Congress envisioned it as an “agile corps of generalists” who would “move about the government much in the way that military officers or foreign-service officers move through the military or the diplomatic corps,” said Jim Read, the director of policy and evaluation at the U.S. Merit Systems Protection Board, which produced the December report. They would bridge divisions within agencies and ensure continuity in operations across administrations, but first and foremost, they would be top-flight managers. The SES, though, has drifted away from its original mission: The “agile corps” is not full of many generalists at all, and the senior executives receive little training to hone their management skills. We need to get these unelected, unaccountable, agenda-thwarting Obama appointees out of our government if we are going to fully drain the swamp. Congress hasn’t been blind to the SES’s deficiencies, either. As a 2012 Congressional Research Service report details, reformers have had their eye on the SES for years. The House Veterans’ Affairs Committee, for example, has gone after problems at the SES level at the VA. The government has been trying to reform the civil-service workforce for as long as it has existed. Forty years after its creation, many of the problems the SES was intended to solve persist. The Deep State is deeper and wider than most people know, and instead of being hidden and secret it seems to be public and filled with well-paid Obama hold-overs. Unqualified, political appointees control the new Presidential appointees and the standard bureaucracy below them. It is hard to believe, and may leave a person outraged, witnessing the audacity of career government employees and the corruption of the systems politicians have put in place. Deep State cronyism built upon graft and obfuscation fills the Senior Executive Service. There is no need at all to have this Deep State shadow government, and these political, over-paid management positions should be filled by highly qualified staff through a comprehensive merit system, not appointed by a partisan president. It is time to pull the plug on the Deep State’s mechanism that creates governmental programs and agencies that make no sense at all, unless these machinations are an attempt to overthrow the government that is supposed to work for We the People. 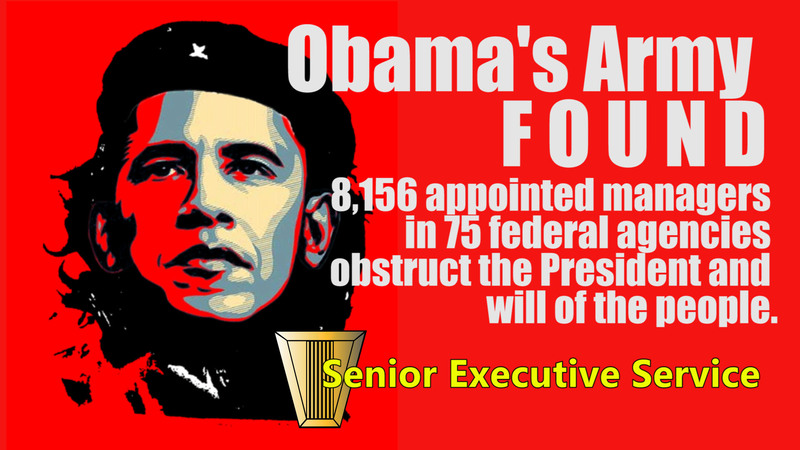 WE NEED TO TAKE MEASURES TO END THE SENIOR EXECUTIVE SERVICE AND TOPPLE THE DEEP STATE SHADOW GOVERNMENT THAT HAS 8,156 OPERATIVES IN 75 FEDERAL AGENCIES, ALL WORKING FOR POLITICAL GOALS OF BARACK OBAMA AND HIS GLOBALIST MASTERS. Feel free to share this meme below to your network of truth seekers. Let’s shine a bright light on this shadow government corruption. The links below has many updates to this original post, including several years of Plum Book listings and tools that the internet researcher can use to uncover the truth about SES.